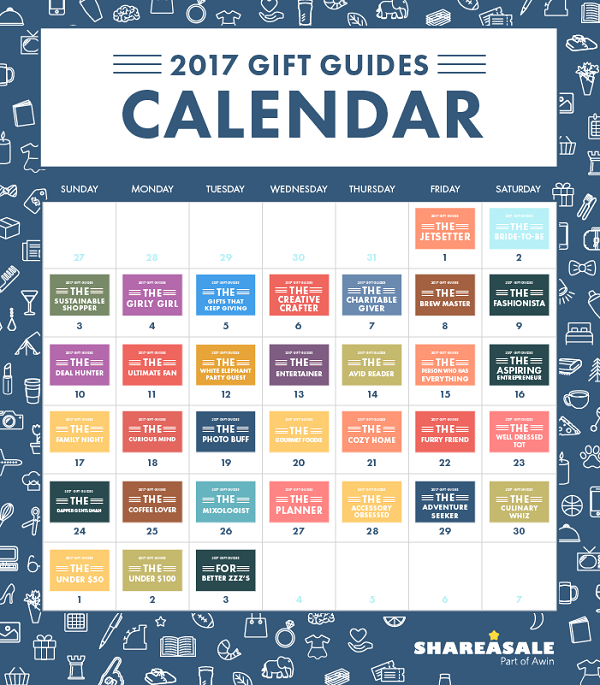 Each year our Gift Guide Calendar becomes bigger and better! With Q4 just around the corner, we hope to help you in all your planning and preparation for the biggest season all year round for online shopping. Halloween, Thanksgiving, Black Friday, Cyber Monday, Single’s Day, Cyber Monday, Christmas, New Years and many, many more festivities drive consumers to online retailers! There is no question that this season is crazy busy for bloggers – both from a business and personal standpoint. Capitalize on the shopping frenzy by planning ahead of time. Start now, so you can enjoy the holidays when they arrive! Find brands that you’d like to partner with and join their program, find products that you’d love to promote, and look for unique new strategies to monetize your website. Planning your posts doesn’t have to be stressful with our gift guides. We will be posting a new themed gift guide on the ShareASale blog every day during the month of September – plus several bonus days in October. *Our collection of 2017 Gift Guides are our gift to YOU this holiday season! We hope they help you find inspiration to write some fantastic blog posts, reviews and gift guides of your own. Additionally, you’re bound to find some new Merchants and Retailers to partner with this holiday season – happy browsing! If you prefer social media – we will also post our gift guides on Facebook, Twitter, Instagram, and Pinterest. Follow us to make sure that you can see them all! Want to whole collection now? We understand – we are excited about them too! Get all 33 gifts guides right now by filling out the form below.